No matter how careful we may be, accidents will happen. Paper cuts, nose bleeds, kitchen accidents and razor nicks can lead to blood getting onto our clothes. Blood can be a difficult stain to remove due to the protein, especially if the fabric of the garment is delicate. That's the time that we keeps wondering how to get blood out of clothes. It gets even harder once the blood has dried on our clothes. The wrong treatment for stain removal can make the problem worse. Below are some tips to help you save your wardrobe from catastrophe. Removing fresh blood is not as hard as you think. Here are 5 ways that help you to get that fresh blood stains out of your clothes. Rinsing in cold—very cold—water is the easiest way to remove fresh blood from clothing and it works immediately. Continue rinsing in the cold water until the satin has been completely removed from the garment. If the blood is in something that can’t be soaked, such as carpet or furniture, blot with a cloth soaked in cold water until the stain disappears. Be careful as hydrogen peroxide can bleach certain fabrics as well as staining them. Test first on an inconspicuous area. Pour the peroxide on the stain, but don’t let it foam outside of the stain area. Use a solution of half-peroxide/half-water on delicate fabrics. You may need to add it several times as the action stops after a few minutes, wiping the stained item between each addition of solution. Once the stain is gone, rinse in cold water. If some of the stain still remains after rinsing with cold water, mix cold water with salt to make a paste. The amount of paste you need will depend on the size of the stain. You want to saturate the area completely. Rub the paste onto the stain. Rinse with cold water and repeat if necessary, then wash the garment in a normal cycle. If you do not have salt or hydrogen peroxide on hand and rinsing with cold water hasn’t completely removed the stain, apply a generous amount of soap or shampoo to the area. Scrub the area well to work the soap into the fabric and add more cold water, if needed. Rinse in cold water until the lather and stain are gone. For more stubborn stains, mix one tablespoon of ammonia with a half cup of cold water and pour this over the stain. Let sit for a few minutes and then rinse with cold water, repeating if necessary. Do not use ammonia on delicate fabrics such as silk, linen, or wool. 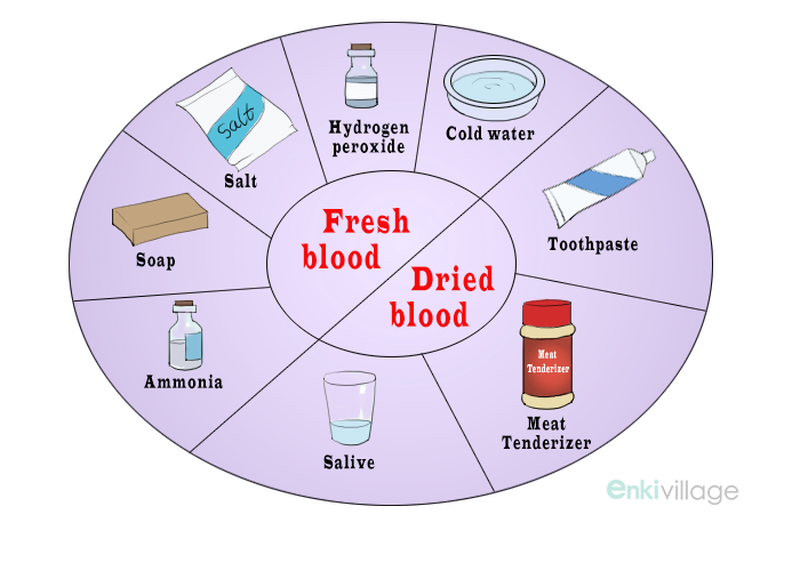 How to get blood out of clothes, especially dried blood stains makes a lot of people frown. Here are 3 effective ways to get them stubborn blood off your clothes. This works best on clothing and linens that can be put into a washing machine or washed thoroughly by hand after treating the stain. Apply the toothpaste to the stained area and let dry. Rinse thoroughly with cold water. Wash the area with soap and rinse again in cold water. Repeat, if needed then wash in a regular cycle. This is best used on sturdy fabrics such as denim. The unseasoned meat tenderizer contains enzymes that will break down the protein in blood, but can damage delicate fabrics like wool, silk, or linen. Fill a bowl with one cup of cold water and drape fabric into shallow water. Sprinkle a tablespoon of tenderizer onto the stain and let sit for as long as a day. Every few hours massage paste into the stain. Rinse and then wash in a normal cycle. Like meat tenderizer, saliva contains enzymes that break down protein in blood. This method is best for very small stains. Gather some saliva from your mouth then spit onto the stained area. Rub the fabric until the stain is gone. Rinse the garment in cold water. Lime juice has natural bleaching properties that help remove stains from fabrics. Add two tablespoons to a half cup salt in a bowl and mix. Lay fabric on a flat surface and pour mix onto the stain. Let it soak in for about ten minutes. Scrub the area until the stain disappears. Rinse in cold water. Wet the stained area and apply a generous amount of baking soda. Let it sit for fifteen minutes then check the stain. Repeat this with every 15 minutes until the stains was completely removed. Rinse in cold water then launder as usual. You can spray the stained area with glass cleaner without diluting it. Allow it to soak for a few minutes then rub the area with a clean cloth. Wash in your usual detergent. Check to see if the stain is gone and repeat if necessary. Timing is important. It is easier to get a blood stain out of fabrics while it is still fresh and hasn't had time to dry, or it will be really difficult to remove. Avoid hot water. Hot water will cause the iron and hemoglobin in the blood to bind to the fibers, which is opposite to our purpose. Let the cleaning solution you use work on the stain. Be gentle and don’t rub the area. This won’t help remove the stain and could damage the fabric. Do not try to remove blood stains from clothing that is dry-clean only. Take them to the cleaner’s and inform them of the stain.